NEW ORLEANS (AP) It took Rajon Rondo 20 games in a Pelicans uniform to rewrite franchise record books. As Rondo gains more comfort with his new team – and its unusual lineup featuring two dynamic All-Star big men – his ability to recognize mismatches and put talented scorers in advantageous spots could be exactly what New Orleans needs. 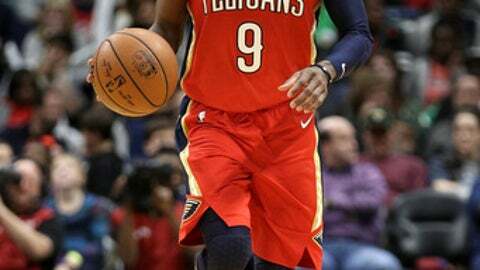 Rondo set a franchise record with a career-high 25 assists in just 30 minutes on the court, Anthony Davis had 33 points, 11 rebounds and six blocks, and the Pelicans beat the Brooklyn Nets 128-113 on Wednesday night. DeMarcus Cousins had 27 points and 14 rebounds, and Jrue Holiday scored 23 points for the Pelicans, who’ve won three straight – all by 14 or more points. Rondo was quick to point out his whole team moved the ball well and shot accurately. The Pelicans had a record 40 assists as a team on 48 total field goals. Davis even credited Rondo, who missed the start of the season with an abdominal injury, for improving team defense. ”He’s been getting on me about not blocking shots, so for the last couple games I’ve been trying to just go after everything,” Davis said. Currently sitting on the edge of the Western Conference playoff picture, the Pelicans entered their current three-game homestand looking to string together victories against teams that have struggled on the road. They got off to a solid start against Brooklyn, leading by as many as 16 in the first quarter, 23 in the second and 33 in the third. Pelicans coach Alvin Gentry pulled his starters in the third quarter, only to have to put them back in following a 17-0 Nets run that trimmed New Orleans’ lead to 91-75 heading into the fourth. Caris LeVert scored 22 points, Nik Stauskas added 21, and both were instrumental in Brooklyn’s brief surge. But the Pelicans’ lineup of Davis, Cousins, Holiday, Rondo and E’Twaun Moore, who had 20 points, quickly created separation again and set up a stress-free finish. The only drama in the latter stages of the fourth quarter was whether Rondo would eclipse franchise and career marks for assists. He broke Chris Paul’s mark with his 22nd assist and set a new personal best with his 25th, then came to the bench to a standing ovation and a congratulatory handshake from Gentry. Nets: Quincy Acy scored 18 points and Rondae Hollis-Jefferson 15 points. … The Nets fell to 5-12 on the road. … Brooklyn shot 19 of 38 (50 percent) from 3-point range. Pelicans: Davis was 4 for 4 from 3-point range and the Pelicans went 17 of 33 (51.5 percent) from deep overall. … Injured small forward Solomon Hill, who has been away from the club in Los Angeles while rehabilitating from surgery to repair an offseason hamstring tear, attended the game and sat on the bench in street clothes. It remains unclear when he’ll be cleared to play, but when the season began he was not expected back until February. Rondo is the only active player with 25 assists in a game and among only seven players in NBA history to have done it, the others being Scott Skiles, John Stockton, Jason Kidd, Kevin Johnson, Nate McMillan and Isiah Thomas. Nets: Visit Miami on Friday night. Pelicans: Host Dallas on Friday night.